Successfully Added 3.5G HSDPA USB Modem (Windows / Mac Wireless Internet) to your Shopping Cart. 3.5G HSDPA USB Modem: high speed wireless internet at any time and any place - just insert your SIM card! This new version is compatible with both Mac and Windows desktops/laptops/notebooks/netbooks. High Speed: With HSDPA (aka High-Speed Downlink Packet Access or 3.5G), you gain download speeds of up to 7.2Mbps, letting you browse the internet, email your friends, chat online, and download files at speeds that surpass most public WiFi hotspots. Easy Access: Simply insert your 3.5G compatible SIM card, plug in the HSDPA USB Modem, and you're ready to surf - easy as that. The convenient plug-and-play design detects the modem and begins installing the software from the USB stick automatically, allowing you to take your internet with you anywhere, on the road, in the office, worldwide. Total Compatibility: No matter where you are in the world, this HSDPA USB Modem allows for high speed wireless internet access 3.5G networks. It even provides backwards compatibility with quad-band GSM/EDGE/GPRS networks (2G, 2.5G, 2.75G, 3G), which means wherever you have cellphone signal, you can access high speed internet! Auto installing driver from the device. This product does not work with routers. Can quickly connect to any preset networks (all major providers from Afghanistan AWCC through to Yemen YTC) or enter your own settings. 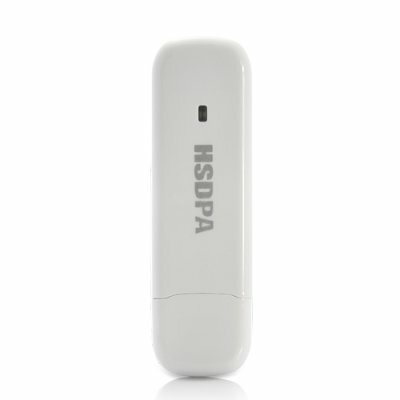 When you connect this HSDPA USB Modem to your Mac or Windows desktop/laptop, the software will install directly from the modem without having to use a CD. This makes it more convenient to use the device on different notebooks and netbooks, ensuring you have maximum mobility without sacrificing functionality.